The Importance of Being Understood is an innovative and thought-provoking exploration of the links between the way we think about each other's mental states and the fundamentally cooperative nature of everyday life. Adam Morton begins with a consideration of 'folk psychology', the tendency to attribute emotions, desires, beliefs and thoughts to human minds. He takes the view that it is precisely this tendency that enables us to understand, predict and explain the actions of others, which in turn helps us to decide on our own course of action. This relection suggests, claims Morton, that certain types of cooperative activity are dependent on everyday psychological understanding conversely, that we act in such a way as to make our actions easily intelligible to others so that we can benefit from being understood. This idea of 'beneficial circularities' is at the core of Morton's investigation of the interdependencies between folk psychology and social behaviour: we understand each other because we have learned to make ourselves intelligible. Using examples of cooperative activities such as car driving and playing tennis, Adam Morton analyses the concepts of belief and simulation, the idea of explanation by motive, and the causal force of psychological explanation. In addition to argument and analysis, Morton also includes more speculative explorations of topics such as moral progress and presents a new point of view on how and why cultures differ. 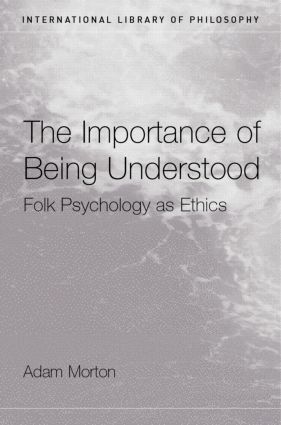 The Importance of Being Understood forges new links between ethics and the philosophy of mind and will be of interest to anyone in either field, as well as developmental psychologists.